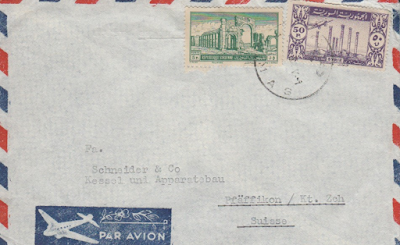 Cover sent from Damascus with an airmail stamps. At right are the pillars at Kanaqua, which I can't figure out where that is. Does anyone know? On left the Arch of Septimius Severus at Palmyra from a 5v 'Buildings' issue. Stamps are known to be great icons of pop culture, propaganda and nationalism, and it is startling to now to be faced with a cover which now has essentially an archival image, an image on a stamp, that while ancient and immemorial, is now no longer, having been blown up by dynamite in 2015.